Workplace conditions at Tesla’s California factory have been scrutinized for months, after an employee in February publicly aired extensive concerns over compensation and injuries, sparking a renewed effort to unionize the Fremont facility by the United Auto Workers. And a new report released on Wednesday claims the automaker’s own internal data shows that injury rates at Fremont exceed what’s found across the industry. In particular, the post highlighted the factory’s Total Recordable Incident Rate (TRIR)—which it said is the leading metric for workplace safety—through the end of the first quarter of 2017. Tesla’s rate is 4.6, the automaker said, more than 30 percent better than the industry average of 6.7. When it comes to earlier years, the “facts”—as Worksafe’s analysis indicates—aren’t as spectacular. Worksafe based its report off Tesla’s OSHA Form 300, which logs work-related injuries that companies must provide employees upon request. Worksafe says employees first requested copies of the logs in April. What the OSHA forms showed is that Tesla’s TRIR rate in 2014 and 2015 outpaced the industry, at 8.4 and 8.8 respectively, the latter more than 30 percent higher than the industry average. And perhaps that explains the earnest, forward-looking phrasing of a statement given to Jalopnik by a Tesla spokesperson in response to the report. But Worksafe’s report said Tesla’s injury data recorded through Q1 “is too preliminary to be considered accurate given Tesla’s somewhat erratic reporting patterns.” One example of the reporting patterns can be found in how Tesla handled its 2016 injury data, the report said. On February 1, according to the report, Tesla reported 705 injuries on its 2016 OSHA 300 log. But three months later, it revised the report, which showed 840 reportable injuries. 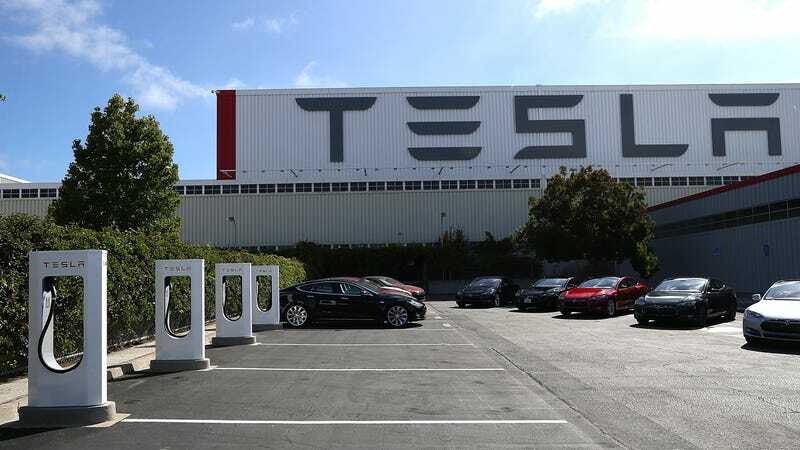 The release of Workplace’s report was publicized by a third-party spokesperson hired by the UAW to assist in coordinating media interviews with pro-union Tesla employees earlier this year. Last month, the UAW filed charges with the National Labor Relations Board, claiming Tesla was illegally intimidating employees behind the union drive.